Get Fit Anytime | Anywhere | On Demand! Is there a DVD workout available for this? The DVD “Let’s Roll!” will be available by the end of April. Stay tuned! In the meantime the online workout link has been made public and is listed in the product listing on the website or on our YouTube Channel 3X3 FIT. Or, right here! 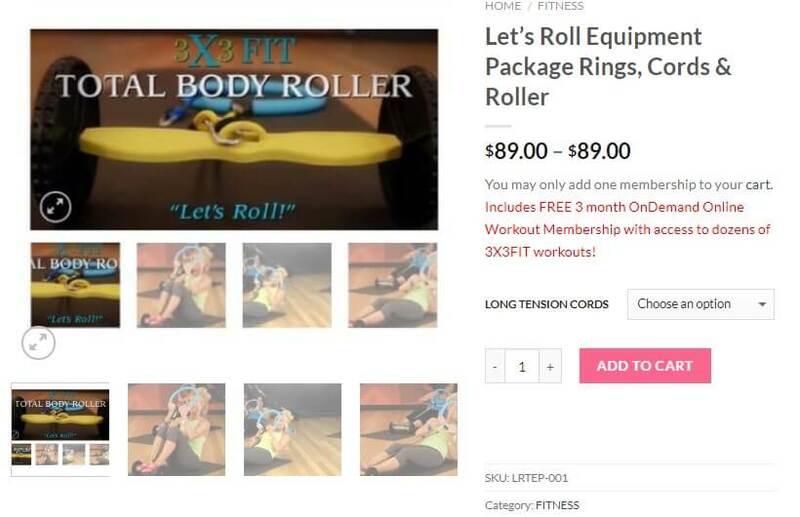 What if I don’t own the rings yet and want the total body roller, which package is best to purchase? You can pick any 3X3FIT package and purchase the total body roller separately or see Total Body Roller Total Equipment package for $89 (includes rings, cords, total body roller & FREE 3 month OnDemand Membership). What if I am tall and my cords are too short for me? Just simply add a 10″ standard cord to one end of the Power Cords. You received two 10″ cords when you received your rings. Simply clip it on to the end. What if I am super petite (5″ or under) and have too much cord? 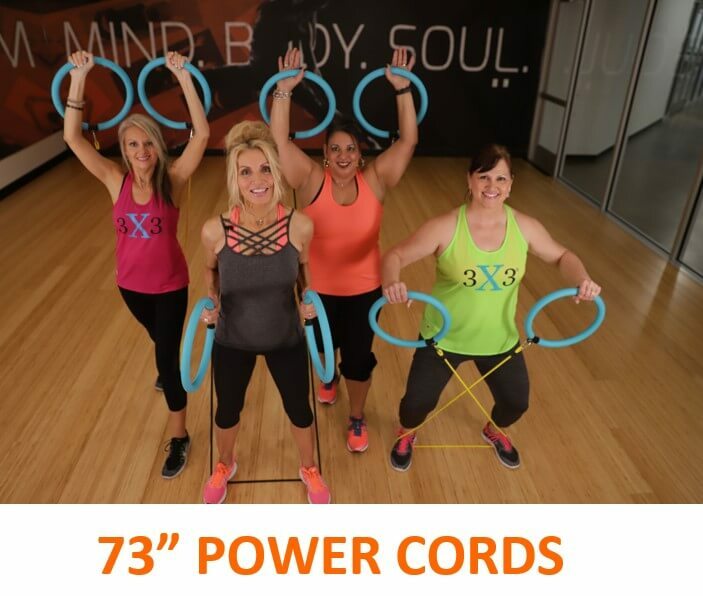 One of the gals featured in Power Sculpt Arms – Super Sets is 5 ft tall and successfully used the 73″ cords with all exercises. You simply use a wider stance for most exercises. Or, worst case scenario, put a couple knots in your cords to shorten them. IMPORTANT NOTICE: Use only 3X3FIT G3 (1.5 lbs. each) & G2 (.09 lbs. each) rings with 3X3FIT workouts along with 3X3FIT authorized accessories and attachments. Earlier generation rings are not equipped to handle the force of the LONG cords, Power Cords or Total Body Roller. See G3 Equipment on SHOP page of website to upgrade your equipment. If you purchased your rings prior to 8/17 and your rings are the original one-half pound each, you should not use with your light rings with anything other than the 10″ standard cords you received with your purchase. How do I know what Long Tension Cord to choose in packages that include this item? Answer: We have provided a chart that is based on height. Simply choose the appropriate cord based on the chart provided in each of the packages. These long tension cords are a key feature of many packages and allow you greater range-of-motion for specific exercises. How do I access OnDemand that I purchased? Answer: The 3X3FIT ONDemand workouts are accessed by logging in to www.3x3fitondemand.com and selecting WORKOUT PROGRAMS. When ordering the OnDemand system you were issued a LOGIN and prompted to enter a PASSWORD. Please reach out to us at customercare@3x3fit.com if you do not know your LOGIN/PASSWORD and we will reset your PASSWORD and email you your LOGIN credentials. Please be advised that Customer Care hours are M-F 9 AM – 5 PM CST. The 3X3FIT ONDemand workouts are accessed via a browser. They can be accessed anywhere you have an internet connection and can login to www.3x3fitondemand.com. If you wish to view the workouts on your TV and your TV does not have the ability to access a browser, simply login to www.3x3fitondemand.com on your laptop/tablet and connect to your TV with an HDMI cord. Some users have all used wireless mirroring from their mobile phone/laptop to their SmartTV or Roku. What if I don’t know my OnDemand LOGIN and PASSWORD? Answer: Contact CustomerCare@3X3FIT.com and we will send you your credentials. We may issue you a new, temporary password to make it easy for you to use the OnDemand service. You can easily change to a personal password by logging in and going to My Account and selecting “change my password”. Question: How long does it take to ship? Answer: Shipping is always measured in “business or working days” Standard shipping is via FedEx Smartpost. FedEx Ground transports to your local post office and then the USPS usually delivers the package. In some cases, FedEx handles the package all the way to your door. Standard shipping is 7-10 business days from when it ships. RUSH Shipping is 5 business days or less from when it ships via USPS Priority Mail, excluding Alaska & Hawaii. Alaska & Hawaii may take up to 7 business days for RUSH. Orders are processed with-in 48 hours during business hours M-F. Question: I feel a little bit of sensitivity in my shins with a few of the exercises when using Generation 3 Rings. Is this normal? Answer: You might feel a little sensitivity in your shins however, your shins will get used to it. Just like riding a bike, you may experience soreness/tenderness the first few times you ride your bike each season, you also may experience some tenderness in your shins the first few times you do the exercises that touch the shins. Your shins will adjust. If the tenderness persists, we advise you skip those exercises. There are hundreds of exercises, so skipping those that bother you will be the best. Question: Can I use the commercial grade equipment for the spinning exercises? They seem too heavy. Answer: Please skip the (3) spinning exercises in this workout if you purchased your equipment after 8/17. The equipment has evolved to commercial grade equipment and is too heavy with more durable, harder material and not meant for the spinning exercises. If you purchased equipment after 8/17 you may still opt to do the spinning exercises by simply holding the rings (one in each hand and circling your arms). This is just as effective. The original Toning Rings developed by Kim Marie Ross will be available by 9/18 for purchase and will be less than 1/2 lbs each with soft foam for comfort in Spinning. Stay tuned! Question: Do you have a Get Started information guide? Answer: Go to Home Page and Click on “Getting Started” module. This includes helpful hints for getting started as well as Kim’s suggested weekly work out regime for beginners to advanced levels. Question: How can I play the workouts if I do not have a DVD player? Answer: You can order 3X3FIT OnDemand or streaming with no need for DVDs or DVD player. Or, another option is to purchase a portable DVD player (range from $39+ at Walmart, Target or other retailers). Our customer base continues to ask for OnDemand vs. DVDs so we offer both opportunities. Question: How do I know which workout to start with? Answer: If you can navigate from the floor to a chair easily, then any of the workouts will be appropriate for you. We do, however, recommend you begin with Flat Belly Abs & Sculpted arms, Summer Arms & Abs, Upper Body Power Sculpt, Power Sculpt Arms – Super Sets or Let’s Roll! Question: How many steel clips (hooks) should I have in my package? Your arms may be tender the first few times, but will adapt. If it is too uncomfortable, skip this exercise (The weight and durability of the equipment has evolved over 6 years. 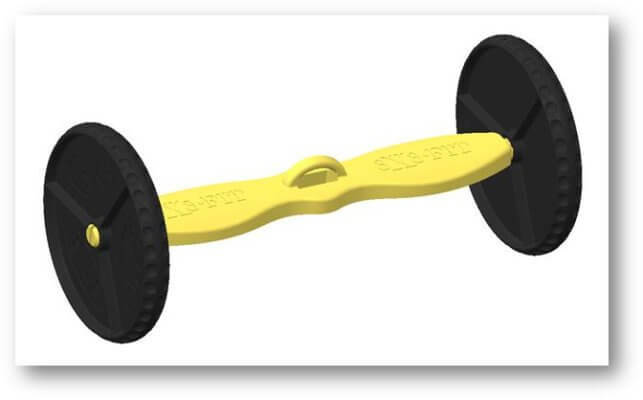 G2 & G3 rings are built heavier (commercial grade) and not meant for the spinning exercises). There are only (3) spinning exercises and hundreds of other exercises. So, we advise to simply skip the spinning exercises unless you own the original lightweight rings sold August 2017 or before. #4 is something to consider. Question: Can I purchase the other workouts later if I don’t order with my package right away? Answer: Yes. However, not all workouts are available for purchase on individual DVDS. All workouts are offered the moment they launch with OnDemand membership. Go to www.3X3FITOnDemand.com for information about online OnDemand membership to all workouts. Super simple one step login! Question: Can I purchase a 2nd set of rings without any DVDs? Answer: Yes, see SHOP tab. See equipment only options. Question: Do you have any stores that carry the 3X3FIT program? Question: I am a fitness instructor (or gym owner) and would like to purchase the rings for my class members. Is there a discount? Answer: We do have Club Kits available. There is special pricing for studio/gym members with a minimum purchase order. Please visit SHOP pages for more information and pricing. Answer: The RETURN POLICY is that you can return equipment within 14-days after receiving (excludes beauty products). All Club Kits purchased on the group fitness site are final sales. If there is a warranty claim, we will replace the defective product. OnDemand Memberships are non-refundable unless purchased directly with equipment. In this case, you will have 14 days to make the return after receiving your purchase and will receive a full refund for the equipment and OnDemand membership. All beauty products are final sales. All apparel & sports bras can be returned within 14 days after receiving, however, no refund will be made if garment or sports bra has been worn. Question: What happens if a ring breaks? Question: Does your product contain LATEX? Answer: No. Everything in the 3X3FIT products are latex free. Question: What materials are used in the construction of your RINGS? Answer: Featuring Choice of G2 or G3 Rings. Question: What is the difference between Extender Tension Cords and Long Tension Cords? Answer: See detailed instruction for all tension cords below. 3X3FIT no longer offers extender cords. The LONG cords took the place of extender cords in Jan 2018. It is advised you read this before beginning your exercise programs and will be helpful in achieving your best overall workout experience. Question: What if I am 5’2 – 5’3? Which cords are best? Answer: Your height is right on the cuff so ideally you will have your best workout experience if you purchase both the 16 inch and the 20 inch LONG cords. (See page 2 SHOP PAGE to add tension cords). However, if adding a 2nd set of cords does not fit your budget, please order the 20 inch. Put a knot in both cords if they are too long for you. You will know after you do the workouts a few times. Through much experience with our customers, they have found having both sets is helpful as you will have some exercises that feel better with a bit shorter and some a bit longer. Question: Do you offer Live Training? Answer: Yes. However, in order to have a LIVE TRAINING in your City, a minimum number of instructors is needed. A Host gym is needed in order to orchestrate enough class members for training. Please email Denisew@3X3fit.com for details. Question: Do you offer CEU’s? Answer: Yes. However, in order to receive instructors must attend one of the SCWFIT MANIA events. Next event & location is Florida Mania April 12 – 14th. See SCW FIT Florida Mania for details and to sign up for 3X3FIT Classes. Question: Do you offer special pricing for bulk orders? Answer: Yes. See Club Kits on SHOP pages at www.3X3FIT.com of email CustomerCare@3X3FIT.com for a quote if your need is different than what is being offered on SHOP pages. Question: Do you have any 3X3FIT classes in my area? Answer: See www.3X3FIT.com and click on “Classes” tab to see who is teaching in your city. If you do not see an instructor teaching, she/he may not be listed. Maybe will be the first to teach in your City! Question: What is the warranty on the 3X3FIT rings? Answer: 3X3FIT warrants this product to be free from defects in workmanship and materials under normal use and conditions for a period of 14 DAYS FROM THE DATE RECEIVED. The Company’s obligation under this warranty is limited to replacing or repairing the Product, at the discretion of the Company. All warranty coverage extends only to the original retail purchaser from the date of purchase. 3X3FIT‘s obligation under this Warranty is limited to replacing or repairing, at 3X3FIT’s option, the product at one of its authorized service centers. All products for which a warranty claim is made must be received by 3X3FIT and accompanied by sufficient proof of purchase (photocopy of the original receipt or packing slip, indicating the date of purchase). All freight and handling fees are the responsibility of the consumer to pay, both to and from 3X3FIT. All warranty claims must be pre-authorized by 3X3FIT. This warranty does not extend to any product or damage to a product caused by or attributable to freight damage, abuse, misuse, improper or abnormal usage, or repairs not provided by 3X3FIT. This warranty does not cover ordinary wear and tear, weathering, failure to follow directions, in Warranty beyond that specifically set forth above is authorized by 3X3FIT.